The Maxwell Air Force Base Squadron Officer College (SOC) and Auburn University’s College of Education took a symbolic step toward forming a new partnership by signing a Memorandum of Understanding, June 22, 2015. The memorandum, signed by Col. Gerald Goodfellow, SOC commander, and Sherida Downer, head of the College of Education’s Department of Educational Foundations, Leadership and Technology, allows both colleges to combine resources in their efforts to study virtual and augmented reality technologies in the interest of improving learning outcomes of students from both schools. 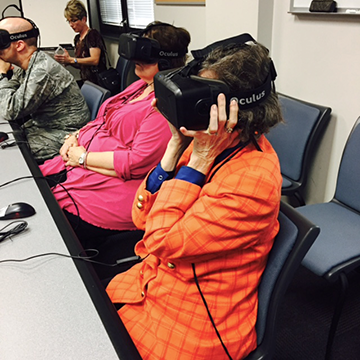 The memorandum allows SOC to share its Virtual Innovations Learning Laboratory (VILL), which includes virtual and augmented reality technologies, with an EFLT doctoral student, Col. Tony Millican. The SOC will also share research obtained from the use of the VILL and conduct open-house presentations for Auburn’s EFLT faculty and graduate students for exposure to the technologies and discussions on potential research and publication ideas. In turn, EFLT will collaborate with SOC faculty on jointly-authored publications, keep SOC updated on initiatives within the Auburn University community pertaining to further advancement of virtual and augmented reality technologies, and invite SOC to present VILL research at the EFLT spring and fall Educational Leadership Institutes.